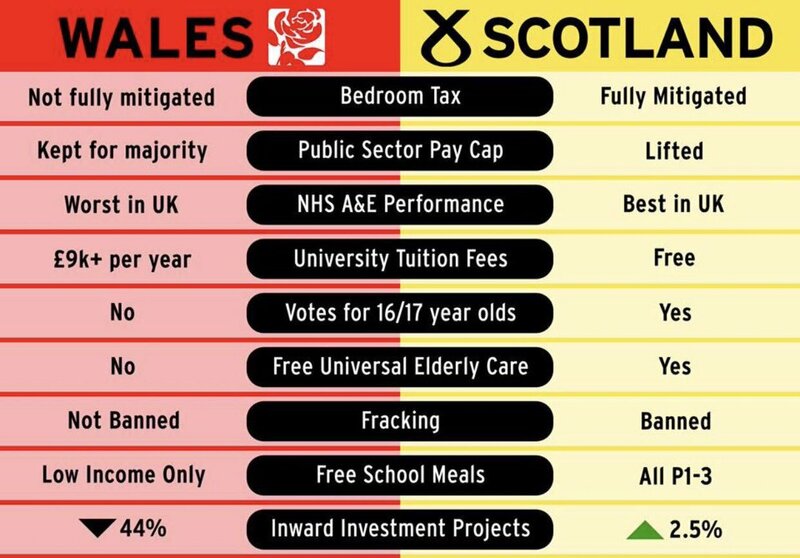 National Left: Corbyn " Welsh Labour Government doing its best, SNP not enough". Corbyn " Welsh Labour Government doing its best, SNP not enough". It appears that UK Labour leader wears different pairs of spectacles depending on weather he is visiting Wales or Scotland, in the former he sees a "Welsh Labour government doing its best in the wake of Tory Westminster cuts, whilst in the latter The SNP were "passing the buck on austerity and handing down cuts "
"Jeremy Corbyn has said he believes the Welsh Government is “doing its best” when it comes to key devolved areas of education and health. Speaking after his speech at the Welsh Labour conference, Mr Corbyn said that austerity was to blame for funding issues, and that blaming the UK Government was not a "cop out". In the wake of repeated warnings from unions and teachers about funding cuts impacting on staff, pupils and forcing them to shut schools early and even clean their own toilets , he said he was aware of the issues which had been highlighted in recent weeks, but blamed the financial settlement the UK Government gives Wales. “The money for education is part of the devolved package and there’s been a huge cut," he said. Mr Corbyn denied that was an excuse. “It’s not a cop out at all. It’s the reality. That money is then handed on to local authorities to run the education service. There’s one authority that seems to have had the biggest problem in trying to close schools early, I’d be interested to know why they think that’s necessary because for me, the priority is keeping more children in school five days a week”. Asked his message to the head teachers affected, he responded: “The same thing happens in my own constituency in England where head teachers tell me how grotesquely underfunded they are. “The Welsh Government has done its best to try to prevent that happening to education in Wales, but the reality is with this huge cut in expenditure from central Government in the UK there’s going to be a problem. “The answer is an end to austerity and the answer is a Labour Government for the whole of the UK which will properly fund Wales”." "Jeremy Corbyn has accused the SNP of standing up for the establishment rather than Scotland by "passing the buck" on austerity and handing down Conservative spending cuts. The Labour leader used a visit to Glasgow to attack Holyrood ministers, and put forward his party's case for a new Constitutional Convention to look at how power could be devolved across all the nations and regions of the UK. Ms Dugdale called for the new act last month when she revealed plans for increased federalisation of the UK, including a "people's constitutional convention" to decide on a new political settlement, but Mr Corbyn said later he "wouldn't use the words new Act of Union". The UK Labour leader is expected to say that both he and Ms Dugdale "agree on the need to set up a People's Constitutional Convention, led by Labour, to see how best we can redistribute reclaimed powers and resources across all our nations and regions". He also highlighted his determination to "replace the unelected House of Lords with a democratic second chamber" that will give all parts of the country an equal say in the UK parliament. "I want to replace the House of Lords with a Senate for the Nations and Regions," Mr Corbyn stated. With the prime minister having announced plans to take the UK out of the European single market in the wake of Brexit, he again warned against creating a "bargain basement Britain". Such a move, he argued, will result in "even less money for our underfunded and overstretched NHS, less money for social care, whose budgets have been slashed by billions and less money to give our councils". Mr Corbyn added this is "something Scots know all too well with the proposed SNP budget cut of £327 million to local government". Turning on the Scottish government he said: "Just like the Tories, they're devolving austerity and passing the buck." The Labour leader continued: "The SNP government simply passes on Tory austerity and is increasingly failing to govern effectively or fairly. "Trying to talk Left at Westminster when in opposition, whilst acting Right in power at Holyrood, is not standing up for Scotland. "It is not standing up for Scotland failing to tackle the scandalous level of health inequalities here in this great city of Glasgow and across Scotland. "It is not standing up for Scotland overseeing a growing attainment gap between children from poorer and wealthier backgrounds. "It is not standing up for Scotland refusing to use the powers of the Scottish Parliament to invest in all of these areas – and many more where the SNP has failed. "The SNP is not standing up for Scotland. It's standing up for the establishment." Ms Dugdale pledged Labour MSPs will oppose the Scottish government spending plans by voting against its draft Budget for 2017/18." Chris Bryant touts for Speaker's Job. Labour win Newport West By-election.